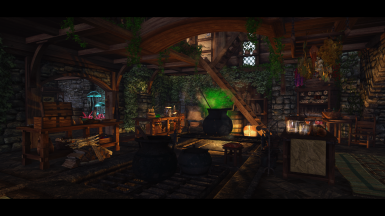 This mod overhauls Arcadia's Cauldron in Whiterun using various resources found on the Nexus as well as meshes and textures from community favorite mods HD Photorealistic Ivy, the High Poly Project and custom meshes created by Ambershore. 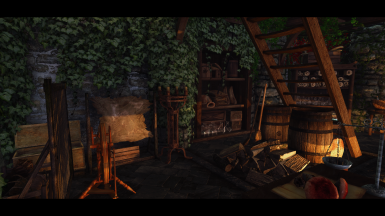 Due to the mod using varios assets from other authors, all with their own permission requirements, please use the links provided and check for yourselves what's permitted. Generally though it's Nexus only, remain free and give credit where appropriate. Can't really argue at that so the same applies to this mod. 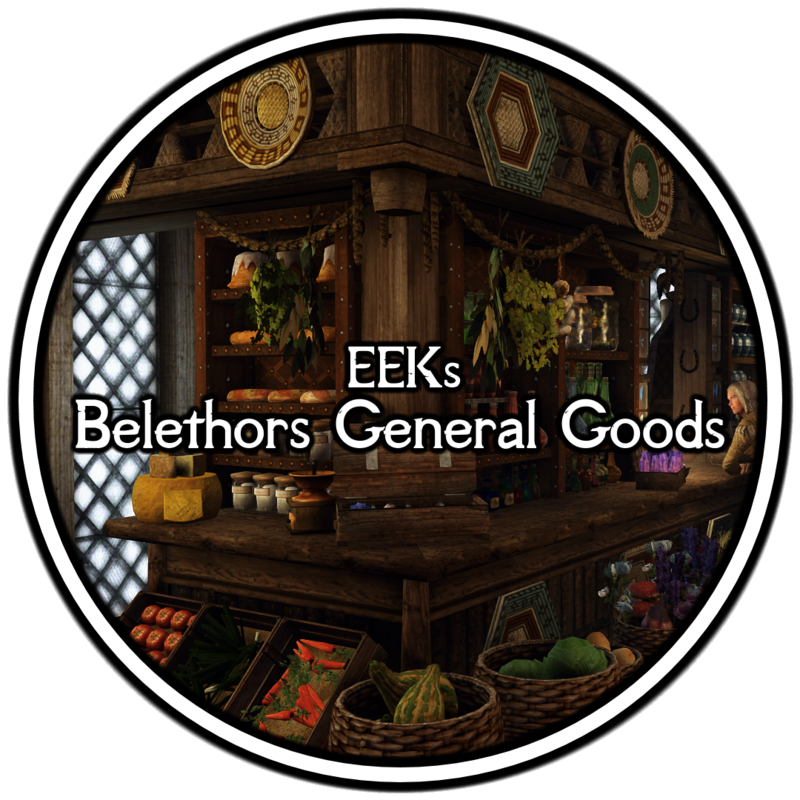 You can use anything in the EEK folders as long as credit is given. Assets in the other named files with EEK_ in front of them have been edited in someway by me and if you wish to use these just make sure the necessary credits are given to the original author. Translations of the esp are allowed as long as you link back to here for the assets and the appropriate credits are given. Patches are welcome but let me know you've done one so I can send people your way. 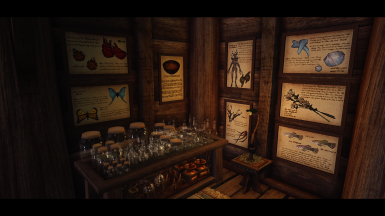 Swaps out static potions for CK statics and loose potions - allows Rustic Animated Potions to work. Clutter moved, deleted and replaced. 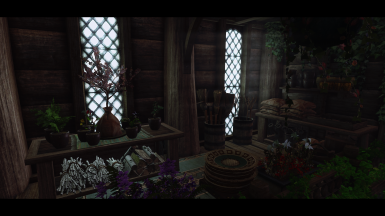 Firewood & twig bundles have had a Aspen bark textureset applied to them to tie in with EKKs Beautiful Whiterun. 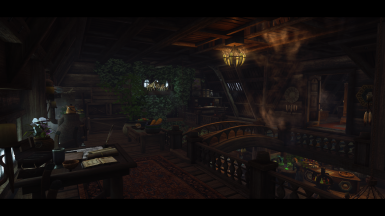 Replaces the middle staircase with a new model from Ambershore. 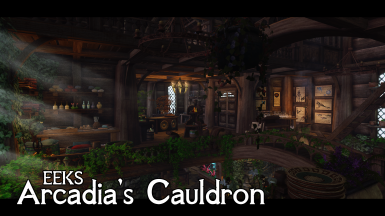 Removed the flower vases and added jazbay cauldrons. All mesh and texture pathing changed to the same naming/file structure as my other mods to help reduce the duplications & file size when merging. For the latest update I have replaced a lot of the statics with harvestable statics that switch when stolen. 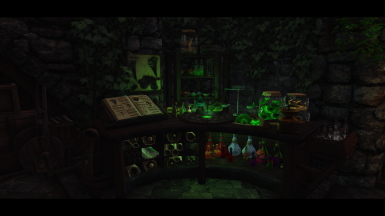 They are linked to their own levelled item lists and you will receive more items as you level. When picked they will not empty fully as I hate seeing empty things in the store for 13 in game days, after this time period everything will respawn. 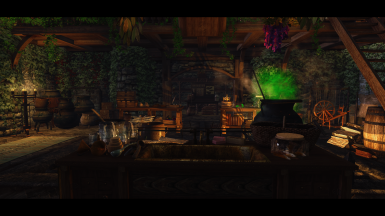 The static potions have also been replaced with a mixture of CK created statics and loose potions so that mods like Rustic Animated Potions can still work. 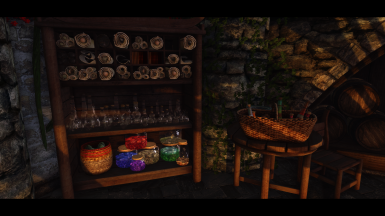 Again I chose to keep some potions as statics so the store doesn't appear empty when looted. 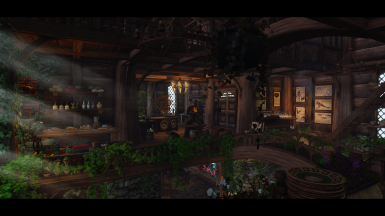 The vanilla ingrediants are still available around the counter and will dissappear when bought from Arcadia. 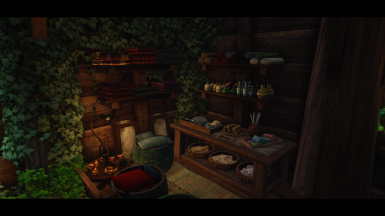 The items in the basement are not set up to be sold this way as they are customer orders and the like. 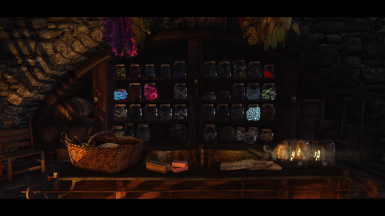 Due to the new size I thought Arcadia could do with a hand so the mod also adds a new NPC named Aalia to act as a store assistant. 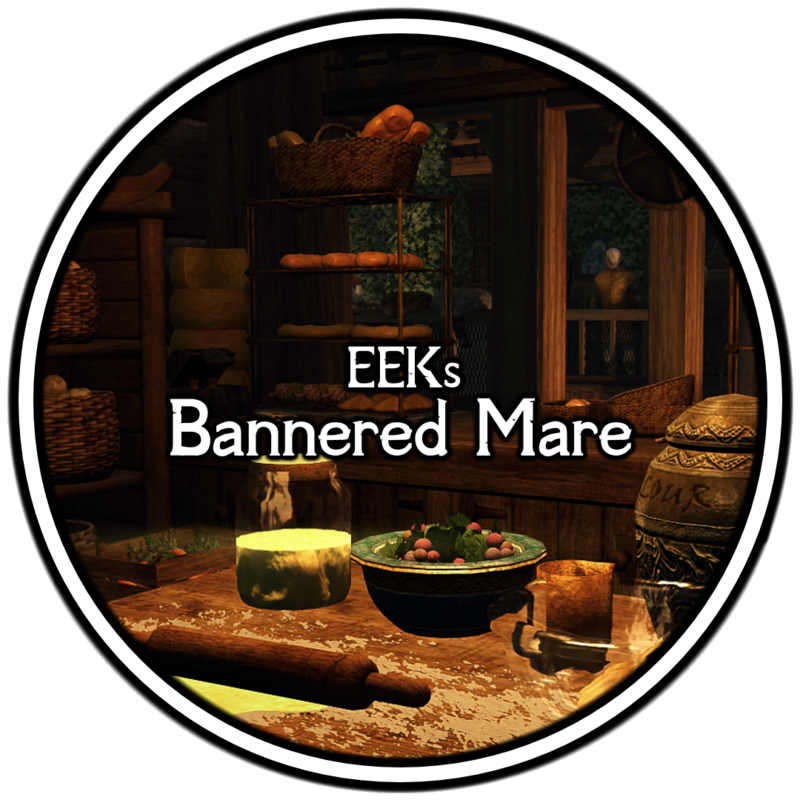 She has her own basic AI package that allows her to sleep, eat breakfast, sandbox around the store and then socialise at the Bannered Mare. She ain't anything spectacular and is only there to bring some life to the store. 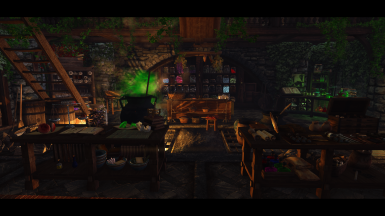 The latest update adds some new idlemarkers to the basement to help utilise the tables better. 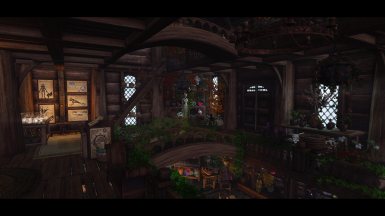 Ambershore has been kind enough to edit the ladder mesh that goes to the top floor to eliminate the over hang at the top. 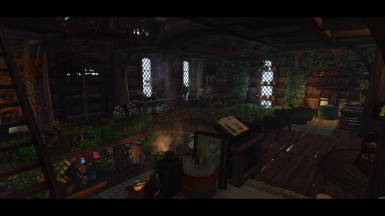 A massive thanks to him for doing this as it had always been one of those things I thought I would never be able to fix, pop over and give him some kudos if you feel so inclined, he deserves it. There are four versions available, pick the one that relates to your load order. 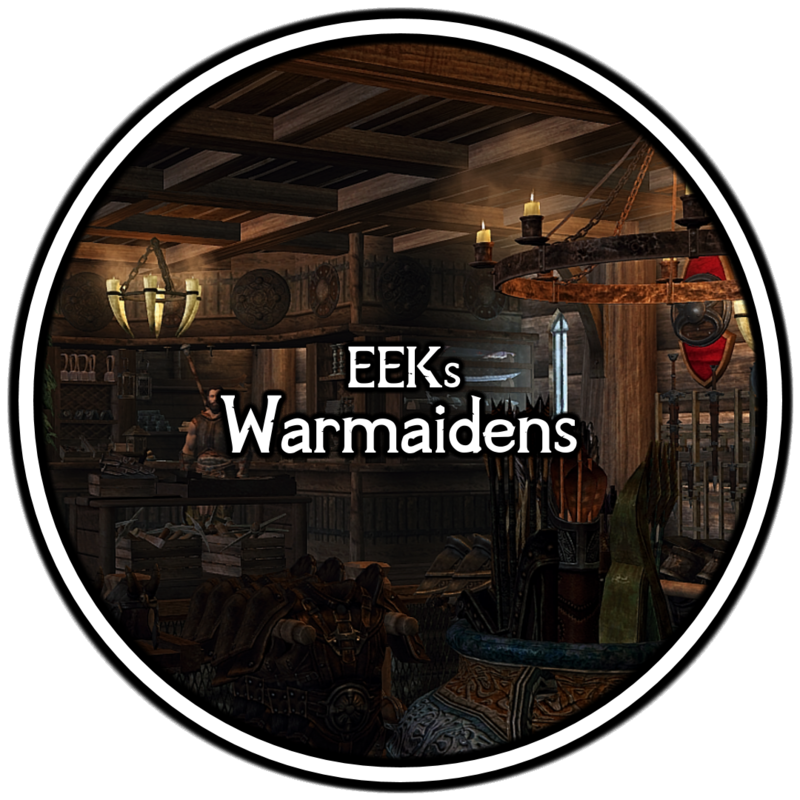 The Immersive Citizens versions move idle markers to more relevant positions and the Open Cities Skyrim versions forward the teleport destinations. Thanks for the videos gents. 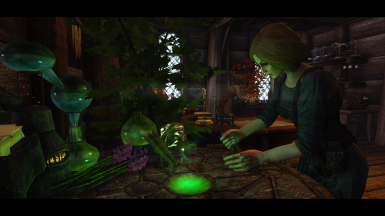 If installing this mod mid playthrough you will probably experience floating objects. These are items that are baked into your save and I can't do anything about them. Deleting them through the console is recommended but don't delete any chests. To avoid this altogether it is recommended to start a new game. 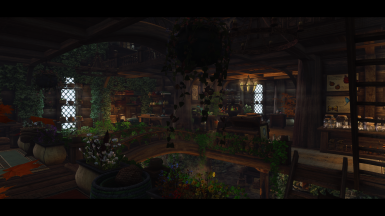 This overhaul comes with its own lighting that covers imagespace, lighting template, bulbs and effects, very much in the style of RLO. 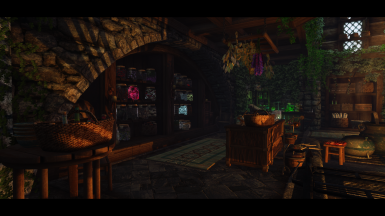 Given the entirely new interior of this mod all lighting mods that place or make changes to the lightbulbs will be very incompatible, for example ELFX and RLO. 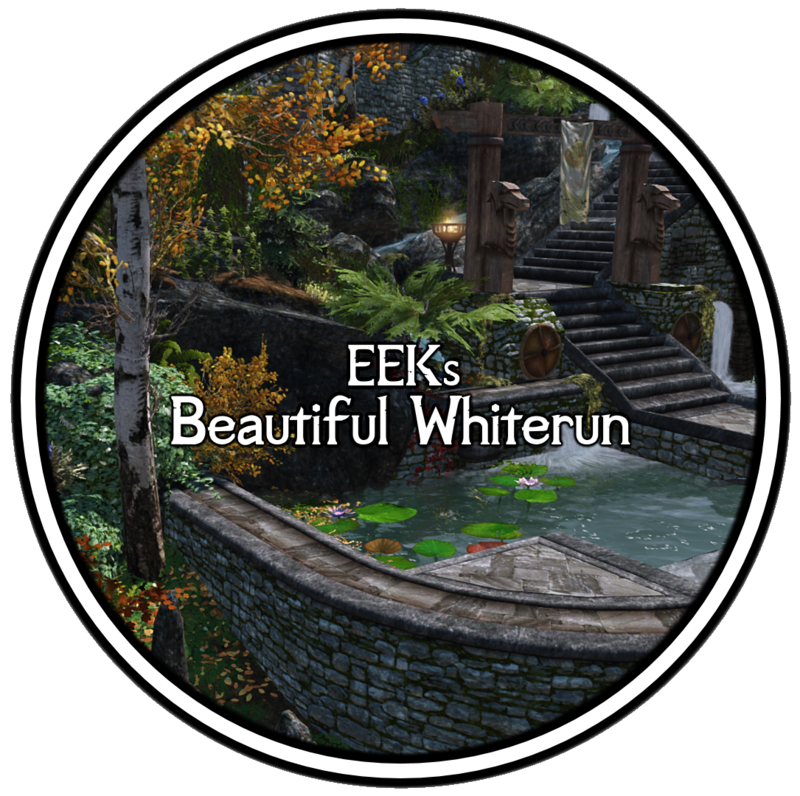 Mods that make changes to the imagespace and lighting template, ELE for example, will be compatible but results may vary. 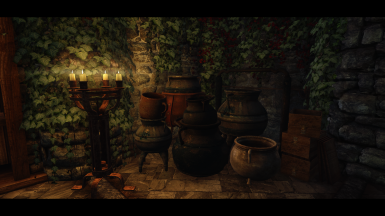 All lighting mods will need to have Arcadia's Cauldron removed from them using SSE edit. 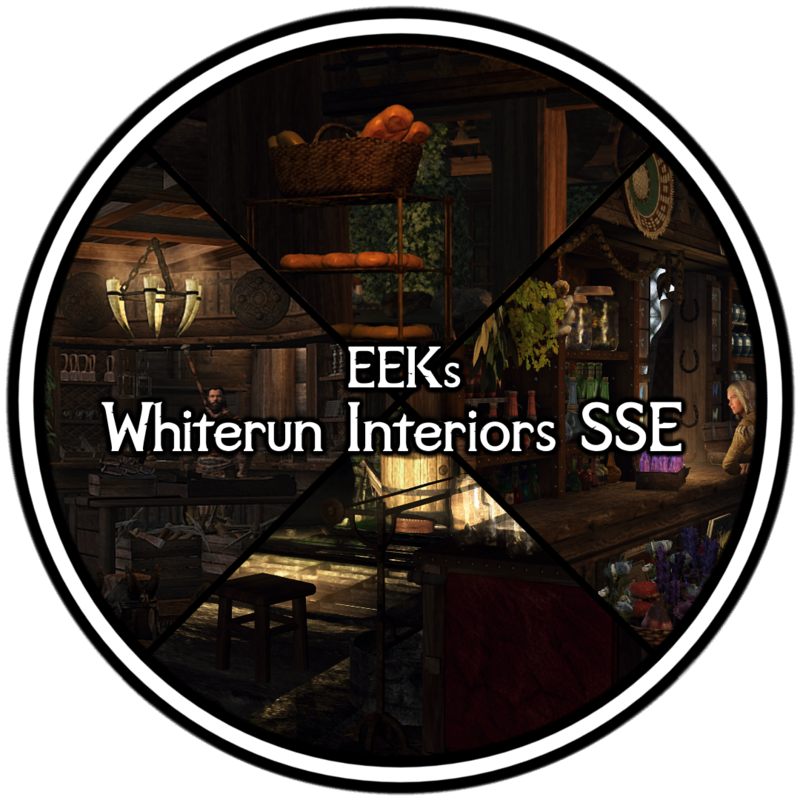 In the case of mods like ELE load this esp after it if you want my new settings or before if you want ELE's. Arcadia's is located in Cell - Block4 - SubBlock7. 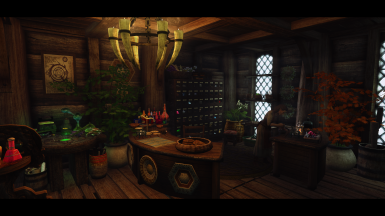 This method will also need to be used on any other large all-in-one interior mods such as Distinct Interiors or Skyrim Radioactive or any other mods you are experiencing problems with. 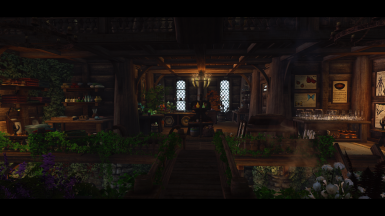 Users of my EEKs Whiterun Interiors mod will also need to delete Arcadia's from that. 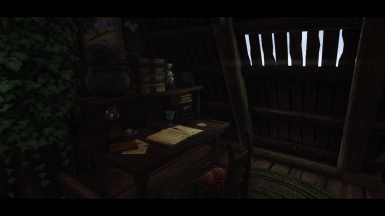 I use Noble Skyrim and have set up some meshes with these textures in mind, mainly the woodbeam01 texture. If your texture pack changes this to stone for example things may look a little off. 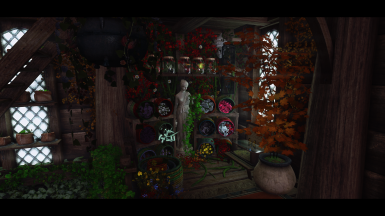 I wanted the harvestable flower & food baskets etc to represent the flowers & food from EKKs Renthal Flora Collection and the High Poly Project, which I use, so they have been made with these textures and meshes. 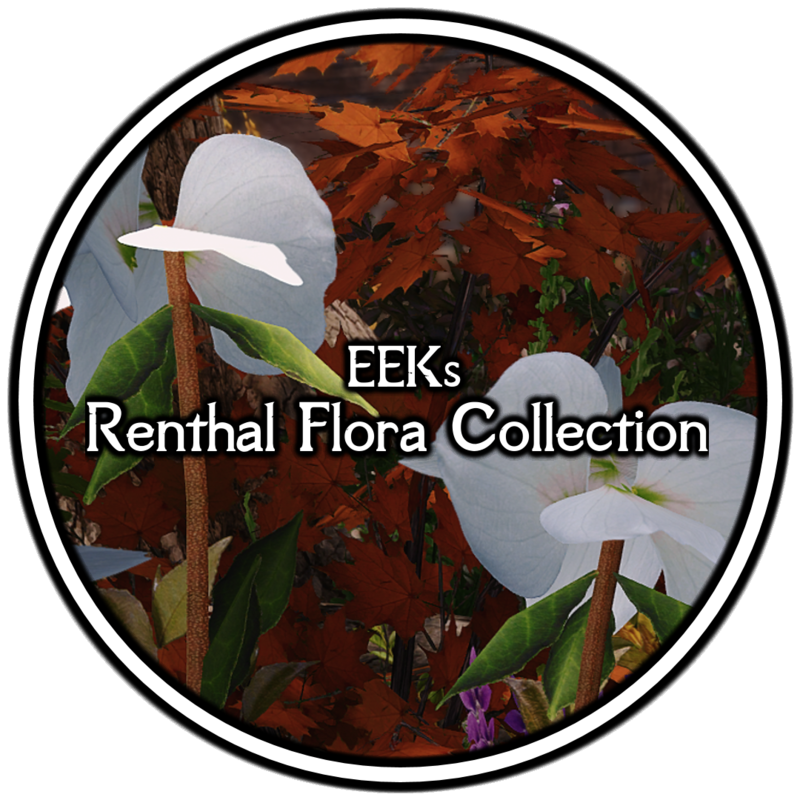 They are included and only affect Arcadia's so there is no dependency on EEKs Renthal Flora Collection or the High Poly Project. 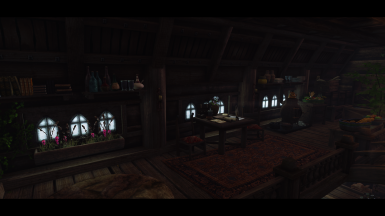 Multiple Floors Sandboxing may help overcrowding problems when using population mods and or Immersive Citizens. Just make sure that your using the right version of this mod for your mod list and this mods esp and patches are loaded after any mod that makes changes to the navmesh. Loot should take care of it. 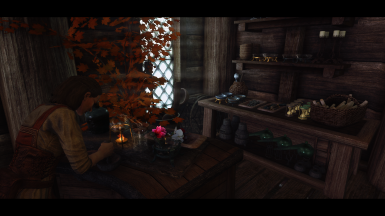 Without these folk's hard work and talent a lot of mods would never happen so a big thanks to them for not only the use of their assets but their very helpful tutorials as well.